We’ve already kicked off the festival season this year with St George’s Fayre here in March, and we are now looking forward to a summer full of fun in Cambridgeshire. If you love live music why not combine your narrowboat holiday with one of these free outdoor events? This popular, free festival has been going for over 40 years, and this year will be held on June 2nd 2018. The day begins with a parade that goes around Cambridge’s city centre, and then returns to Midsummer Common for the start of the fair at midday. There will be over a dozen stages, marquees and areas of entertainment, continuing all day until the festival finale at 10.30pm. Strawberry Fair is entirely volunteer run, and attracts over 30,000 visitors. Check out the Strawberry Fair website to find out more about this colourful celebration of music and art. To get to Cambridge from March by boat you’ll pass through the Middle Levels, and up the Ely section of the Great Ouse. When in Cambridge your cruise will actually take you through Midsummer Common and onwards to Jesus Green and the public moorings near the limit of the navigation. When Strawberry Fayre is over there is plenty more to see in this world famous University City. The 2018 March Summer Festival will be in West End Park, March from 8th to 10th June. Our narrowboat hire base is in the town of March, on the Middle Level Waterways, close to the River Ouse and River Nene. At this free festival there will be an open air stage and activities appealing to all ages. Live music ranges from pop, dance and jazz, to brass and folk. There are always plenty of food stalls and a funfair too. The festival attracts hundreds of people, but after you’ve enjoyed the music, parade, classic vehicles and floats, stalls and amusements you can head back to your own cosy holiday narrowboat for some peaceful downtime. Alternatively, just visit March for the day and try out the boat trips we offer here during the festival. 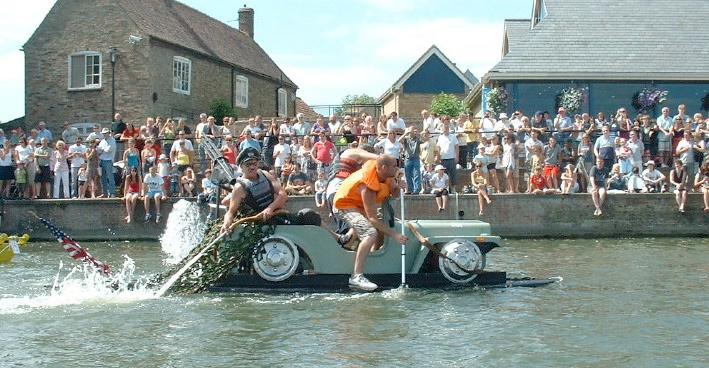 March to Ely is approximately an 18 hour return trip by boat, and the Aquafest enters it’s 40th year in 2018! On Sunday 1st July Aquafest will be covering three premier sites along the riverside, Lavender Green, Jubilee Gardens and the Maltings Green, and it attracts families of all ages and interests. Come for the fun fair, beer tent, burger bar and stalls – and stay for the Annual Raft Race on the River Ouse, with numerous decorated rafts. The two arenas will provide varied entertainment throughout the day, often featuring local talent. There will be music, dancing, interesting demonstration and audience participation. To find out more visit Aquafest. While you’re moored at the pleasant and busy waterfront in Ely, don’t miss the city centre shops, famous cathedral and the museum at Oliver Cromwell’s House. The Stained Glass Museum at the cathedral is stunning, and Ely is also well-known for the Antiques Centre close to the river. This festival isn’t free but it’s worth a mention. It’s an intimate and friendly little folk and roots festival running from 13th to 15th July. Visitors can enjoy a real ale bar, kids’ activities, Morris dancing displays, ceilidhs, workshops and music sessions. Many live-aboard boaters love a bit of folk and a real ale, so why not join them for the weekend this year? Check out Ely Folk Festival. Early bird tickets are on sale until 31st May. If you’d like your narrowboat holiday this year to coincide with one of these free festivals checkout our bookings page now, and see if your boat of choice is available for the dates you want.